Let’s start with the present. You’re basically unbeatable in US races so far this season. Have you changed things up drastically in your training or is this just a natural progression of the last few years? I have made some pretty significant changes with my training. I stopped racing on the road this year, for one. It didn’t come without stress of course. I didn’t have a team. I had to create my own, which I’m sure you know is not a small undertaking. But in the end I had a lot more days to myself and a lot more time to recover. Being able to just relax a little more during road season instead of the usual traveling and race days put me in a lot better position. I was able to do more work with mountain biking and core training and all of these different things. That made a really big difference for me. I knew how much the road racing was taking away from me and how tired I was from it all. To see the plan kind of happen and work has been really good for me mentally. I’m really happy with how I’m riding right now. You’re heading to Valkenburg next week for the first World Cup in perhaps as good a form as you’ve ever had. How do you think you’ll do this season against the best in the world? I don’t know still. I have similar power output to 2012 when I was top ten in the World Cup and I think I have better handling abilities. In some of those races I wouldn’t even get beaten in the physical part, I would get beaten in the handling. 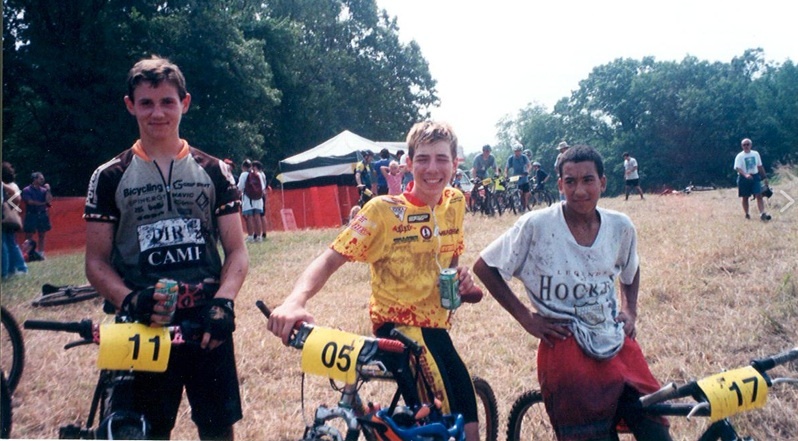 In Tabor when I got 7th, Sven Nys had broken his chain. He had come back to the group I was in– say 5th through 12th or something like that. I’m sitting 6th or 7th and he gets to the front and puts 5 seconds into me through this section of corners. It wasn’t even about putting out 500 watts for 5 minutes, which is what I’ve been training my brains out for. This was just him cornering his bike faster than me. You have to look at all these things. Cyclocross isn’t just one aspect. There’s things you can do that really change the results and get you 5-10 seconds a lap. That’s the stuff I’ve been working on. My power meter says good things. I feel good. I feel comfortable with the riders I’m going over there to race against. All things point in a good direction, now it’s just about going and executing this portion of the plan. Jumping all the way back, how did you get your start in bike racing? I lived in a town with a lot of riders coming up in Connecticut. We all loved mountain biking and rode together. Then some of us started taking it a little more seriously. We had some top-5 national NORBA junior riders. The other famous rider from town is Tom Danielson. Not that Tommy D hasn’t had his flaws, but he’s still a pretty good rider. I grew up a mile from him. All these really good riders were coming up and we would push each other. I had a lot of energy growing up, as a I still do, and my mom was always pushing me to mountain bike. She took me to the events and always wanted me to continue with cycling because it was such a good outlet for my energy. I got really passionate about the bike. I could just go and have a lot of freedom and explore. I loved being in the woods after school for a few hours of mountain biking and later road riding and racing. Cyclocross followed soon after that. My first coach was Tom Masterson. He was a really good masters rider from Vermont. When he got out of coaching my mom sought out Adam Myerson as a coach because of the New England connection. He and I started working together and Adam was the one said, “you should seriously be doing cyclocross.” We had a lot of success together. Tell me about your progression from those early days as Myerson’s protege to where you are now. Backing up a little bit from Myerson, I’d really wanted to get on Team Devo. It was this really cool southern California mountain bike team run by John Kemp. Ryder Hesjedal, Walker Ferguson, Matt Kelly, Adam Craig, Tommy D, myself, Andy Guptill, Jess Swiggers rest in peace–there were these really great talents that came through Devo. John was really good at hand picking people then letting them have fun with it and developing them out. When USA Cycling was in a lull with development, John and RockShox and other like minded people came in and created this junior team. Oakley was really important in it. It was really awesome to be a part of. At 15 I did the Mount Snow World Cup and I got 23rd or something and John Kemp put me on the team. He said “hey come down to my house” and he filled my truck up with a new frame and all this other stuff. That was my ticket to a good team and kind of launched me into this whole realm of free stuff and support and a network of races and people to hang with and learn from. Myerson continued to coach me. I went to the cyclocross World Championships with Team Devo when I was 15. I got 17th there. The next season I won the Napa Valley junior world cup. I got a bunch of podiums at the NORBA junior nationals. It was all going towards pro mountain biking. I loved mountain biking. Then I got mono and it knocked me out for a year. After that I came up to western Massachusetts where Adam was living at the time and where I live now and basically everyone was riding road bikes so I did too. 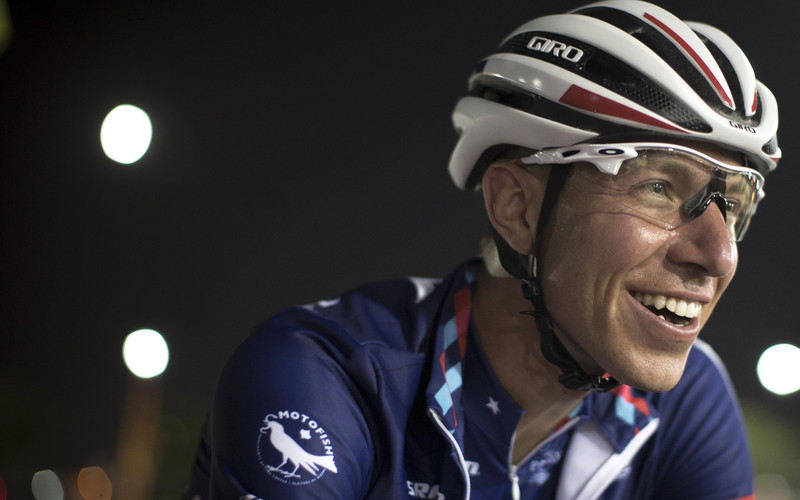 I turned pro with Jelly Belly and raced cyclocross in between road seasons. Now this is my first year not racing on the road and just focusing on cyclocross. What happened to the Rapha Focus team? With bike industry sponsorship, once they see a value return on their investment, it’s good business to step away from it. I feel like the companies got a great ROI. They had a really successful program. Also both of the principles of the program–Scott Rittschof at Focus North America and Slate Olson at Rapha North America–had roles change within those companies and their time was in much higher demand. And because of that lack of time I would say in 2013 the program didn’t have the attention to detail than in years before. With that in mind, I said I’d really like to step up and put together my own program. I knew [Rapha Focus] was going to come to an end. We hadn’t gotten any renewals, so on and so forth. I was able to take those two pillars of sponsorship to develop Aspire and add different partners. It’s a completely different team. Rapha and Focus are a part of it and I still have relationships with both those people who were involved before. But before it ran like a factory team and now it’s a team that’s owned by me. I wouldn’t have said I’d own a team this young in my career. I’m not young, but you know starting a team at 31 wasn’t my idea. But it’s what happened so now we’re making it work. I think it’s a great thing. I think everyone involved is happy and especially some of the partners who spilled over from Rapha Focus. They had great relationships with me and keeping those relationships going and even bringing them back in a better way has been really fun and good for everyone. There are more Americans than ever who can compete in Europe–especially at the U23 and junior level–but it’s still essentially just you, Katie Compton, Logan Owen, and maybe on their best days Elle Anderson and Jonathan Page who can snag a podium spot or even crack the top 10. Do you think there’s a point down the line that American riders can consistently perform at that top European level or do we just not have the development and infrastructure in the US to support that? It’s a big question. A lot has to happen. When you look at the top 10 at a World Cup cyclocross race, almost all of the guys have been world champs, national champs, in most cases junior and under 23 world champions or at least on the podium at world championships. It’s a really small field of riders who perform at a really high level. They’ve got big engines, they’ve got handling, they’ve clearly got really good skill sets for cyclocross. Look at someone like [Mathieu] van der Poel or [Lars] van der Haar or Niels Albert or Sven Nys; they come in and they’re just immediately very dominant. So how do we find those riders in the US and keep them from jumping to the road? Let’s just say Logan Owen or Taylor Phinney are those riders. Right now we’re not going to keep them in cyclocross. There’s a lot more money and contracts in road racing and there’s an existing development structure. With Logan or someone at his level, they look at what their options are and in cyclocross there isn’t a very defined path to follow. With road it’s get onto Trek Livestrong or Bissell Development or whatever. Make a name for yourself for a few years on that program. Get into the big US races, get an agent, sign with a team. They can look to Lawson Craddock and these six other guys who signed for six figures in their first year out of Bissell. That’s a development that makes sense. If I was a rider in Logan’s position I’d be looking at that as well. If you’re Yannick Eckman or Logan Owen looking at cyclocross you’re thinking: “I gotta book my own tickets. I gotta see what the national team’s doing. Cal Giant might take us over to Europe, they might not take us over. I could probably put together some stuff. If I do well, maybe I can get on Cannondale or Power’s new team, but I don’t know if there are any jobs. Maybe I get some start money, maybe I don’t.” It’s a much different sport. 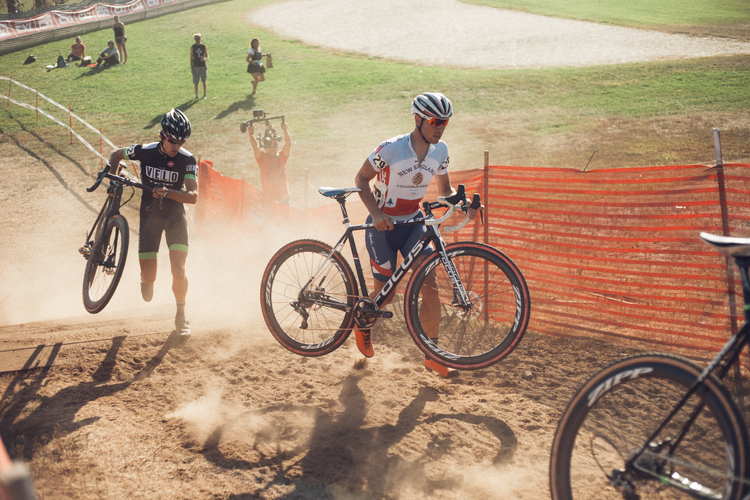 It’s a lot harder to hang on to riders who aren’t really, really passionate about cyclocross. Are we going to get to the place where Americans are in the top results at European races? I think the answer is yes. I think we’re doing a good job with some of the riders we have and I think the development is continuing. One of the reasons I started Aspire is so we can develop some guys out and have a really clear path. So someone like Stephen Hyde or Ellen Noble or whoever those riders are can see a place where they can get to the top and go to Europe, race and make a good living, and have some success with the sport internationally as well. In that vein of development programs, tell me about the JAMFund. JAM stands for Jeremy, Alec, and Mukunda. Those are my two good friends. We basically started it to remove the financial obstacles we saw for so many kids that were coming up in this area. We’ve got lots of success stories out there like Jeremy Durrin. Stephen Hyde’s on the team now. Anthony Clark, Victoria Gates, Christina Birch, Frances Morrison, there’ve been tons of riders who have come through and not just become pros with it, but have become really great cyclists and cycling advocates and great people. We try to teach good stuff to the kids that are coming up through the program, whether it’s about life or the bike. It’s very much a feel-good team. We keep it pretty small. We give grants to young and up-and-coming riders in the area and give them free coaching and stuff like that. But mostly it was started to make sure the kid that’s in Boston or North Shore who shows up on the group ride in November and doesn’t have leg warmers can reach out to us and we can help. We have all that stuff. We have tons of clothing and extra parts and wheels and we can give grants if they want to get into their first races. We have a really cool partnership with the North Hampton Cycling Club. We take on a lot of their juniors and bring them out. We do cross practices. We do a charity ride that basically funds the entire program called the Grand Fundo. It’s really self-sustaining. It’s a really cool thing that’s helped a lot of kids in the area and has developed some really good riders. We’ve got an idea to take one or some of the riders and give them a chance to come up through the ranks with JAM then graduate to the program I started this year with Aspire. Behind The Barriers also seems like an effort to develop US cross by increasing exposure. How did it get started? What are your goals moving forward with the project? Behind the Barriers originally started because I felt like there was a lack of cyclocross coverage in the media. This was back in 2009 or 2010 when Sam [Smith] and I started it. I wanted there to be a place for fans to see these stories and races and I wanted to be able to tell my story. I’m a pretty crappy writer so I wanted to use video. Sam and I had been really good friends and we were the same age and both in the same place in our lives where we weren’t making very much money. We were like whatever, let’s make this happen. Basically the dream for Behind the Barriers was to have Sam come out to races and take some video and see what happens. It morphed into this whole thing. I’d never been on video and I was super nervous to do it. After it launched, people were hating on me on the internet. I thought oh my gosh, everything about this is bad, I don’t want to do this. I felt really anxious about having put myself out there like that. But a couple people were like, “dude, this is great. Just keep going with it” so we did. We built a really great audience for Behind The Barriers. I really wanted to tell the story for the organizers and the riders that I came into contact with, people like Ryan [Trebon] and Tim [Johnson]. Whoever it was, I just wanted them to have that outlet as well. As Behind The Barriers started to replay in a sense–you know it can only be about me so much before people are like “cool, we know that guy’s story”–Sam and I decided to try and use the show to launch some other people. At the same time our buddy Jake [Sisson] said, “you should be doing some race coverage because CyclingDirt isn’t doing a very good job with it and they’re kind of bullying all the promoters.” Before we knew it we had five shows and it had grown into BTB TV. We were doing Behind the Barriers with me and other riders. Then we did Who’s Number 1, race coverage, How The Race Was Won, the Week in Preview. It was a lot of work. It was all to really help the sport get a professional level of media coverage in video format. I think that’s still really important and it’s still a dream of mine to make it better than it is. But this year was definitely a really big challenge with BTB TV from a funding standpoint and everything. It’s a huge, huge undertaking for us. 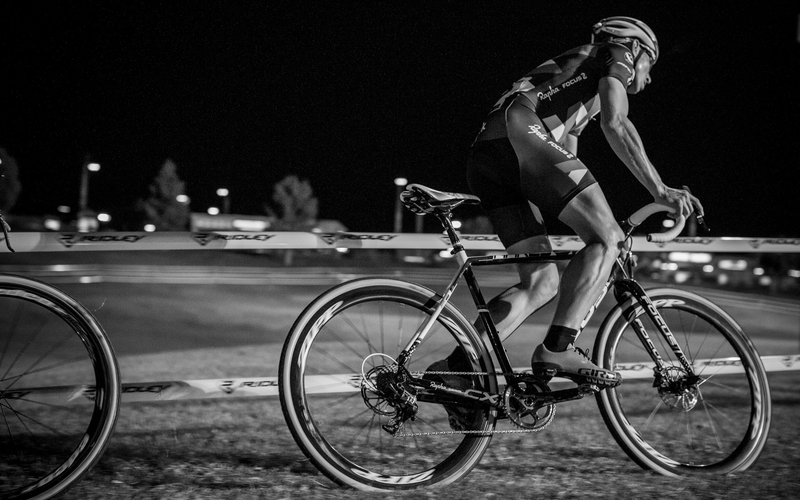 Jeremy Powers racing at CrossVegas 2014. Photo by Motofish Images courtesy Emily Powers. It certainly seems like it. Are you still really involved with the day to day operation of BTB TV? My wife Emily is actually running most of BTB TV now. I’m still seeing it every day for sure. Running a media company and website is very different from the work she was doing before. There are a lot of things that are still being ironed out. Some of them were maybe ironed out last year, but a lot of that went away. We didn’t retain everyone we had on last year. People got burnt out on the project. Even Jake, unfortunately. We lost some good people. I get it. I know why it happened. It’s just unfortunate. It was so much work. So, we had to relearn, then we had to relearn it in a 2.0 sense because we had to do it on less of a budget. We’re definitely treading water just fine and we’re still trying to make sure we hit our goals. There might be some questions of “what’s going on over there?” and it’s just because the budget isn’t there to have more people to do more work. We’re turning out things as quickly as we can. It’s good. We’re still making it happen every day and it’s still really important to us. The good thing is it’s not affecting my racing. Last year Behind The Barriers was really stressful for me, not just on the racing side, but financially. It was really hard. It’s a blessing that this year is so much different to us in regards to the project. Theoretically you’ve got a lot of good years of racing left in you. Do you have concrete career goals both on and off the bike you’d like still to accomplish? That’s one I don’t really have nailed. I’m going to keep with cycling for a few more years for sure. I don’t know. At least two more years after this one. My dream is to get on the podium at a World Cup. No question that’s my number one goal now, even more than a national title. I think if I want to do well, I really have to refine my European and World Cup racing. How close I get this year will determine a lot of what I can do. I don’t think we fully know yet what I can do without having given 110 percent like I am right now. Let’s say my best result is 5th this year, well 5th’s better than 7th. Then maybe 5th can turn into 3rd. We’ll go as long as I continue to see progression chasing the European, World Cup, and World Championship podiums. I don’t need to win every American race or do every European race 44 times to have a good career. But I feel good with what I’m doing. I feel like I’ve contributed a lot, not just with my racing, but to the sport as a whole and given as much as I could with the position and talent I have. I don’t know what I’ll do when I’m done. Hopefully it’s in the cycling world. I feel like I have a lot to give and I know a lot about it. But who knows? I think a lot and I’ve got a lot of things I’d like to do. Maybe I’ll do something completely different and wash my hands of bike racing and cycling. But for sure I’ll be around for a couple more years chasing these cyclocross races and seeing what I can do. This entry was posted in Cyclocross, Interviews, Racing and tagged adam myerson, american cyclocross, aspire racing, behind the barriers, crossvegas, JAMfund, jeremy powers, jpows, NECX, rapha focus, stephen hyde, sven nys. Bookmark the permalink.